While you can't delete your Skype Manager administrator account, you can delete your group. You cannot delete the personal accounts of your users. Members will be able to use features or subscriptions previously assigned to them until their expiry date is reached. We recommend that you keep a record of any information contained within your Skype Manager group before you delete it. If you’re not sure whether the account you want to allocate the remaining Skype Credit is a personal account or a business account, it’s easy to find out. 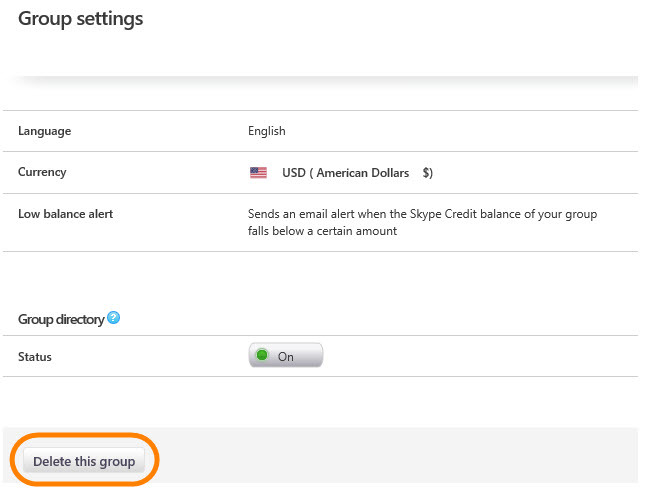 Allocate the remaining Skype Credit within your Skype Manager to yourself or to another account of your choice. Click the name of your group at the top of your Skype Manager Dashboard. Click Group settings from the left menu.